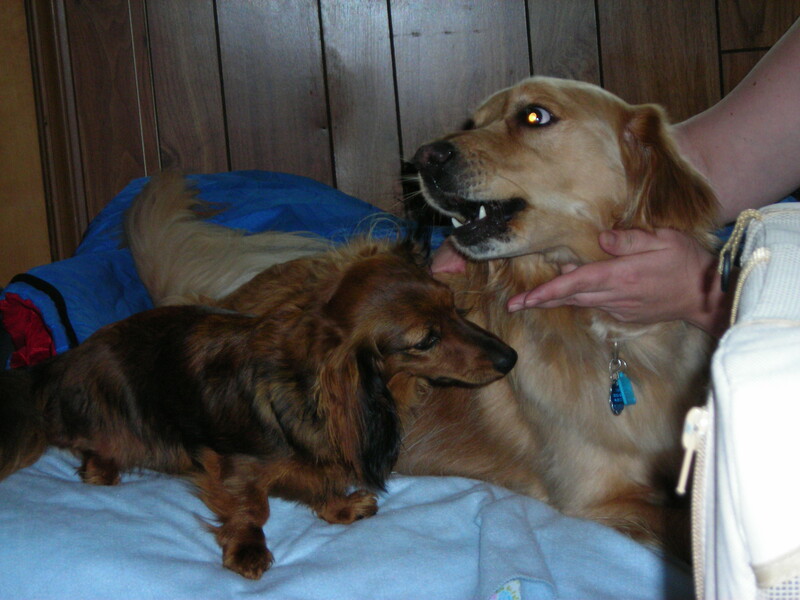 Zoey plays with her golden retriever friend, Sophie. She’d like to meet more dogs at a dog conference. I believe there should be annual dog conferences, either for all dogs or specific breeds. That way we could congregate at one time in one place to discuss how to improve our lives, particularly in the areas of dog food, treats, playtime, walks and being left alone (such as when our BFFs goes to work all day). 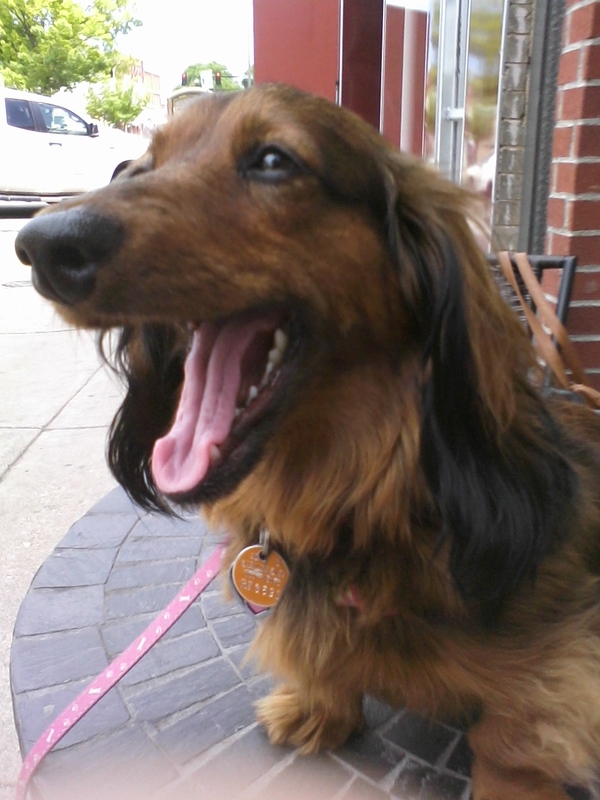 My idea of a dog conference would be the annual Dachshunds Conference for a Very Cute Breed. Shelley, my BFF, is going to the Northern Colorado Writer’s Conference March 28-29. That means she won’t be hanging out with me. Instead, I’ll be heading to doggie day camp, which isn’t my favorite, particularly because it’s foisted on me without my prior permission. If I were to go to my own conference, there would be workshops and panels on improving the dog treats you receive, communicating effectively to get your way, and promoting extreme spoiling. 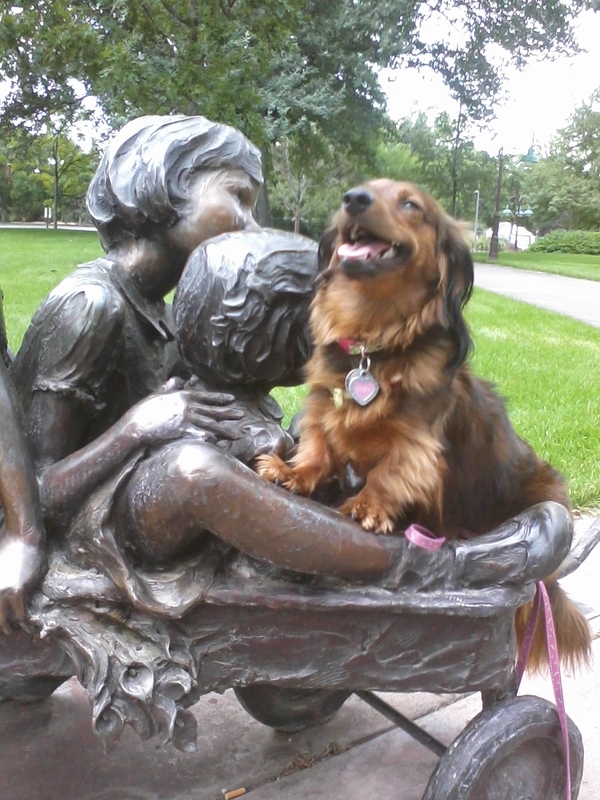 • Network with other dogs to meet new friends and to learn how they appeal to their owners to get what they want, while also obtaining the best, yummiest treats. • Bring your business cards. I have one that says Zoey’s Paw and promotes my blog. 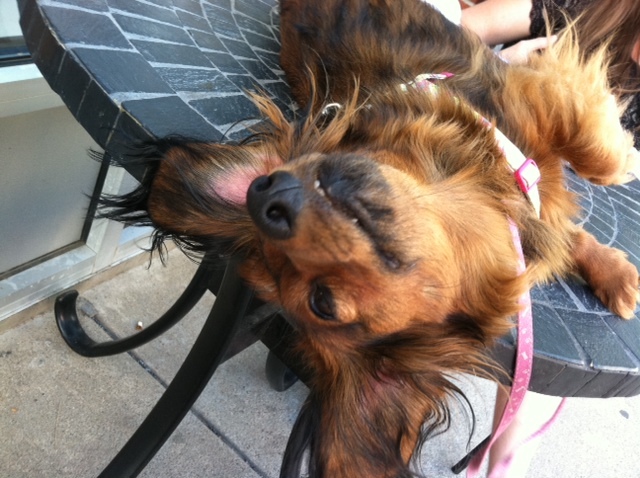 • When you meet new dog friends, follow up with emails (or barks), but no more than two if there is no response. If you meet a cat, be sure to be nice, because cats are okay. 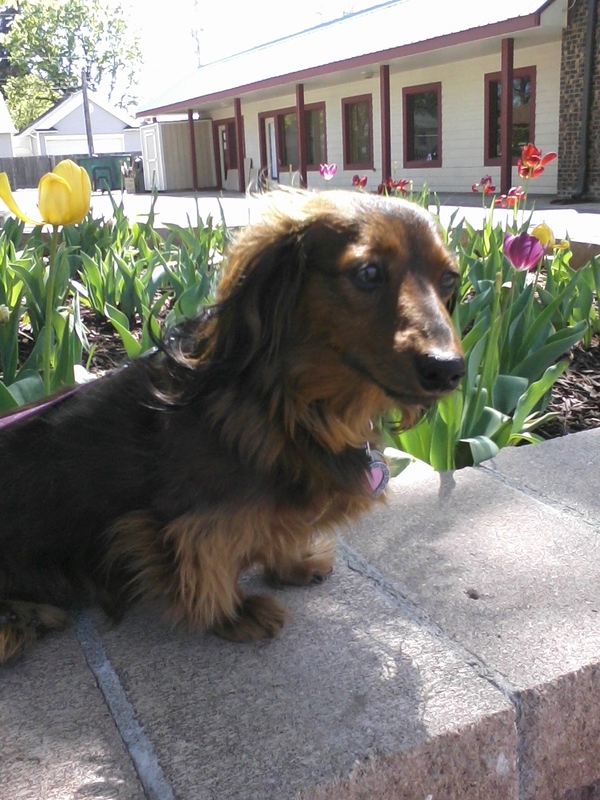 Here I am among pretty flowers. No bees, though. I don’t have much to say about the birds, the bees and writing, like my BFF Shelley, given that I had a big spay surgery when I was just a pup. Here’s a cute photo of me with a cone around my neck following my surgery in spring 2009. Afterward, I was brought to Shelley in a big blanket. I looked very sleepy and went home and took a big nap, cuddled in Shelley’s lap. Now, I’m in good health, probably because I have pet insurance and you know how that goes. If Shelley stops my pet insurance, then something, like an injury or health care, will happen to me, I’m sure. I’m not picky about who greets me. I just want to be petted all of the time, and for everyone (except the big dogs) to be my friend. Here are my poses to show how I seek and then get attention. I really mean it. Please, please pet me. If you don’t pet me, I will interfere with what you’re doing. 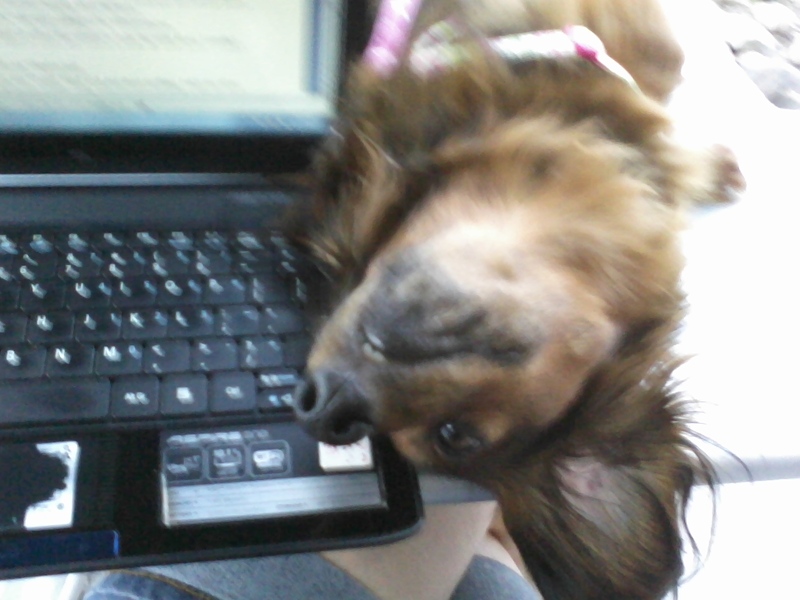 Don’t I look cute as a lapdog on top of a laptop? I am happy wherever I am, especially with art. My BFF Shelley has to shop to keep me happy. She gets me treats and toys and my boring, organic dog food. I would rather she shop for some other necessary things that I currently am lacking as an apartment dog. I would like a big backyard, cats in the house that are my friends but don’t need attention from Shelley, and continual playtime on carpet and not on slippery, wood floors. I spin out when I try to run, so after a few bumps I’ve learned to walk when we do the fetch or chase games. Shelley’s dad pointed this fact out to her when she asked why I’ll run around his plushy, carpeted house, where he has a big backyard with cats, and not at her little apartment. It’s very much a big duh! My BFF needs to realize that I need attention, which I don’t get enough of, because as a dachshund, I need it to be constant. This is how I get attention. When I go on walks, I sniff up to people’s feet, hoping they’ll notice me, thinking, “Oh my, there’s an incredibly cute dog, and I must pet her.” They usually ask to do so, and I feel the glory of being seen. When we go to the pet store, I look at customers and store associates with my big brown eyes, hoping they’ll turn to find out who is staring. When they do, they see a cute, darling dog, and here comes the attention. And when we get coffee or eat out at a patio-restaurant, I greet everybody. See Zoey. Pet Zoey. Thank you!